I don’t often get up to Harlem. Recently I was sent up for an assignment to write about some graduate students who are volunteering to help children in schools in Harlem with math. They are part of a program that pairs students with struggling schools in the surrounding area: the children they work with have been identified by their teachers as being at the bottom of their classes. I was going to interview the students at their biweekly meeting in a building formerly known as the Hotel Theresa, at 2090 Adam Clayton Powell Boulevard. Once upon a time the Hotel Theresa housed 300 rooms and was where Fidel Castro stayed when he came to New York City to speak at the U.N. after the revolution, according to the New York Times. Now, the hotel houses an assortment of offices, including the floor through of offices where the students were meeting,. It was snowing. I stood on 125th Street using my Iphone to get my bearings. I moved to New York more than 20 years ago, but I still have trouble identifying compass points when I come out of the subway in parts of the city I don’t normally visit. I found west and began walking. There was a Starbucks, an H&M; I was not the only one with a handheld device. A boy in a t-shirt staggered by, smoking a cigarette down to its stub. In the distance, I could see the Apollo Theater’s marquee. I turned South and entered the Hotel Theresa. It’s a block-long imposing white building whose first floor looks no different than that of its neighbors, but whose upper floors look like they were photo-shopped in from another era. I entered through the main entrance, also not particularly descript, and passed two official looking men who did their best to pretend we were not in the entrance to a building. Other than the receptionist, who was chatting up a friend on his cell phone, I was the first person to arrive. He brought me into the empty meeting room and told me the temperature was likely to be erratic and so I should open or close the window to my taste. Outside the window, through the snow, I could see the Adam Clayton Powell State Office Building, like a slick brown ski-slope giving out onto 125th Street. I was moved to start writing. The parallel was obvious. Bitter divided country; ugly, partisan, uninformed bickering about the value of teachers. Sloppily alleged selfishness of teachers who want job security, ignorance of the great equaling influence of public education in America, the idea that poor people somehow were required to be special in order to be given a safety net to prevent them from falling; the graceless behavior of the rich should be universally praised, simply because they’re not poor. Etc. etc. etc. And here were the actual volunteers in question. I stopped writing and began interviewing. First came a girl from Florida then came three others, then four more and the professor who oversees their work. The main success of the students isn’t just their teaching, but the fact that they forge one-on-one connections with the children that enable them to get at why they aren’t learning. The girl who told her graduate student that if she cut her head open she wouldn’t find anything in her brain turned out to have problems with self-confidence resulting from issues at home. The boy who wasn’t doing his homework turned out not to want to do it at home because his brother laughed at him when he couldn’t figure it out. And, an added bonus, the graduate student who figured that out also fixed the simple computer problem that was keeping several terminals out of commission long before the city could get to it. These were mostly fairly quotidian solutions; but they seemed to be the result of someone having the time to pay truly close attention to the students they were dealing with, something the students had in part as a result of a stipend they had each won. The graduate student who helped the child with self-confidence issues made fun of herself for having thought she knew exactly how the experience was going to go. She had already selected the children she thought she should focus on before that particular child picked her out, seeking her help, causing her to rethink her choices. She came to understand that the situation would dictate which of her skills were most valuable, not the other way around and was flexible enough to allow that to happen. She taught the child to recite positive things about herself in front of the mirror, and when something embarrassing happened to the child, made her feel better by telling her a story about a similar experience she had had. These particular graduate students aren’t likely to go on to be teachers; this program is intended to give them context for the work they will do later as classroom professionals: psychologists, even academics. But the time they had spent in the classroom had energized all of them and almost all had signed on to come back for a second semester. Their energy impressed and diverted me. It took me to the end of the interviews to find out that one of the students had gone to school literally around the corner. Had made it out of these very schools. She became my lead. I’ve been back to Harlem several times since, mostly on my way out of and back into town. When I passed the Hotel Theresa, I thought to myself that now at least I knew something about it. But I didn’t yet. The Hotel Theresa was designed by two brothers, George and Edward Blum, in 1913. Among the other buildings the brothers have designed are the Adlon at 54th and 7th Avenue, the Dallieu at 101st and West End, and my own building, at 760 West End, which like the Theresa, stands out from the others around it, in our case because our building is tinged a slightly orange color. 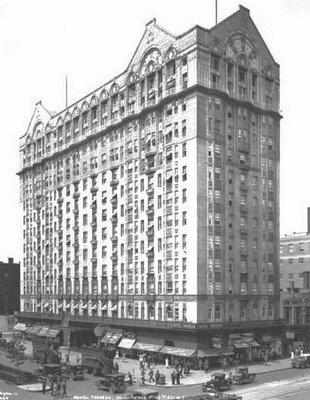 The Blum brothers built the hotel before Harlem’s salad days, and before its other incarnations. Back then, according to the Times, there was a period when only white people could get into the Theresa. It later became a favorite of revolutionaries. When Castro stayed there, he is said to have been visited by Malcolm X. The Blum brothers were reportedly known for being among the few architects of the period to show an appreciation for expressive exterior design. In another country, all of the lives that played out in all of the Blum buildings might have been connected. The Times says the Hotel Theresa will be renovated. But at the moment, it feels cramped. On a street where brand name outposts have put their mark, nothing signifies the expansive dream that was there once unless you look up. There seem to be many people who think that the problems schools solve are easy, straightforward. Like those people who had the gall during the recent budget debate in Wisconsin to assess the value of a teacher from the safety of their Fox News anchor perches. But where their gall was cynical, that of the students I interviewed is based purely on hope; an old story that bears constant retelling. Seeing human qualities across economic boundaries and trying to do something about it is something young people know how to do. That and throwing themselves happily into hopeless quests that challenge their assumptions. It’s the job of the rest of us not to forget the connections that tie us together. Forgetting to look for them, or even to wonder whether they might be there. Assuming that because someone’s on the other end of a story, a lens, or an issue they’re somehow less than human, easily summarized. Failing to understand that before there was a division in the city, there was a city; following up on the simple thought that there might be a reason an office building in Harlem had such an interesting name. Hi, this is a well written post. I just bookmarked your site. Kindly continue the amazingly good posts. Hi, tnx for a well written post. Good read. Oh so WonderFul!!! Me Go Me Go Goood! Thanks for sharing. Your writing is a pleasure for me to read. Centered, but not weighty. How do I learn when you post items?